This paper describes the current state of financial data as it relates to climate change mitigation. The authors present a comprehensive approach that explains how this data flows—from company reporting to investment products—and that includes all the players and steps in between. At present, the usage of such data is limited or in very rudimentary stages of collection and aggregation; however, increased comprehensiveness and sophistication can be expected as the industry matures and as asset owners and managers demand more consistency. The purpose of this report is to help asset owners and managers think more critically about how to incorporate climate data into their investment decision-making. Disclaimers: This paper does not claim to provide any guidance on investment in any particular investment products and is not a solicitation of investment. The opinions expressed in this article are those of the authors, are theirs alone, and do not reflect the opinions of any of their employers or the organizations with which they are associated thereof. Such employers and organizations are not responsible for the accuracy of any of the information supplied in this article. As we move out of one of the warmest average years in recorded history, 2016 is already shaping up to be a salient year of globally focused discussion around one of the most important issues facing the planet: climate change. A number of events in mid to late 2015 held the attention of government officials, business leaders, and citizens across the globe. Pope Francis’s inaugural visit to the United States in September 2015 marked a moment of intense focus around the impacts of climate change on the world’s poor. The Pope’s visit also coincided with the United Nation’s formalization of the new Sustainable Development Goals, which aim to integrate economic, social, and environmental issues globally. Then, from November 30 to December 11, leaders from around the world gathered for the 2015 Paris Climate Conference (COP21), and achieved a universal agreement on climate with the aim of keeping global warming below the internationally agreed upon 1.5 degrees Celsius. This was the first time a global climate agreement emerged in over 20 years of UN negotiations. Any conversation about climate change would be remiss without acknowledging the decline of the coal industry over the past several years as a result of regulations, societal demand, and the growing reliability of alternative energy sources. The Obama Administration, for instance, has placed a moratorium on new coal mining leases on federal lands and a review of the federal program that allows mining companies to extract coal at a cost that is not necessarily reflective of the broad environmental impacts, or the low returns to taxpayers (Kershaw 2016). Furthermore, while the long-term trends in oil remain to be seen, and the reasons for the recent price volatility are complex, the recent downward trend in prices over the past several years sends a signal to the market that a transition to a low-carbon economy has greater potential in multiple aspects of the global economy. Investors play a critical role in transitioning large amounts of capital toward a lower carbon economy that can help mitigate and adapt to climate change. Several trends have begun to gain momentum. One significant shift occurred between 2011 and 2015—divestment of fossil fuels from portfolios representing almost $2.6T in assets under management (Arabella Advisors, 2015). Notable universities (Stanford), cities (Seattle), foundations (Rockefeller Brothers Fund), faith-based institutions (Church of England), and pension funds (Norway sovereign wealth fund) have joined the movement (Fossil Free, 2015). Figures such as US Secretaries of the Treasury Hank Paulson and Robert Rubin, Governor of the Bank of England, Mark Carney, Bob Litterman, former head of risk management at Goldman Sachs, and David Swensen, who has revolutionized endowment investing through Yale University, have presented strong statements supporting the consideration of climate risk in the investment process. Companies that hold fossil fuel reserves as part of their asset base are at risk of having those reserves stranded as more governments take action to reduce emissions and adapt to climate change. The “Stranded Assets” argument poses that a majority of these reserves will likely be difficult to sell if the world takes steps to limit global temperature rise. While carbon emissions are not priced at a global level, the growing number of national and regional carbon regulations signals that a price of carbon is becoming more common across markets. According to The Carbon Tracker Initiative’s 2013 report, between 60% and 80% of the world’s coal, oil, and gas reserves of publicly listed companies are “unburnable” and at risk of becoming stranded. An expectation that companies can no longer sell these reserves would significantly affect financial markets (Campanale and Leggett 2011 and 2013). Climate change also presents opportunities for companies that might gain a competitive advantage through stronger climate regulation and/or changes in public sentiment. Investors are increasingly seeking to mitigate and adapt to climate change through their portfolios from a moral perspective and a long-term economic value perspective. Many investors do not want to profit from, and contribute to, the destruction of natural ecosystems and disenfranchised communities (World Health Organization, 2015). Long-term investors such as endowments and pension funds plan their investments in decade-long timeframes and the impact of climate change is a significant risk to future economic growth. Many investors have already begun to change the way they invest their capital in order to change the trajectory of capital flows towards a lower carbon economy. The agreement in Paris already catalyzed a pledge for financial support for poorer countries beyond $100 billion a year after 2020. Significant capital has already begun to flow. New York State’s $183.5 billion Common Retirement Fund just pledged, for instance, to double its $1.5 billion sustainable investment program. It’s pledge includes committing $2 billion to a new index that will exclude or reduce investments in companies that are large contributors to carbon emissions and increase the Fund’s investments in companies that are lower emitters (DiNapoli 2015). The number of climate-focused investment products, and associated data standards, has also increased to support this growing movement of institutions and individuals interested in divestment and/or reinvestment approaches. However, significantly more capital is needed. According to the International Energy Agency, meeting the COP21 pledges will require $13.5 trillion of energy-saving and low-carbon investments over the next 15 years. With the rapid advancements in data and product development, the landscape of climate finance can seem overwhelming and circuitous to many investors. Disclosure of companies’ contributions and risks related to climate change is often weakly regulated, as is the case in the United States. Thus, climate data can be difficult to find and update, unstandardized, filled with gaps, or simply irrelevant. A better understanding of the investment approaches and products available—as well as the underlying data that support these products—can empower more investors to join the climate investing movement. It is also critical for investment managers to understand the origins and limitations of the underlying data, so that they can better support their client’s decisions if they choose to reduce the carbon exposure in their portfolio. While the number of climate-data providers has increased over the past decade, a lack of standardization in data collection, aggregation, and reporting can hinder effective analysis and the integration into investment decision-making. The first step for climate-focused investors and their advisors is to understand the different types and uses for climate data collection. 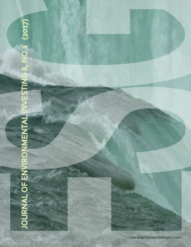 This paper also aims to explain the difficulties investors face in sorting through the climate impacts of any particular company or investment product that professes to be “low carbon” or “fossil fuel free.” Principally, this report serves as the beginning of a roadmap for investment managers who are guiding their investment clients along the pathway to lower carbon investing. It provides a summary of the range of credible information sources related to climate change and investing. There are two main sources of data that are used to evaluate the impact a company is having, or could potentially have, on climate change. These include greenhouse gas emissions data and the amount of reserves that a company is holding (this applies primarily to the energy production industry). These two data sources are discussed in more detail below. Source: Adapted from Sims et al. 2007. In 2001, the World Resources Institute and the World Business Council on Sustainable Development created the Greenhouse Gas (GHG) Protocol (World Resources Institute, 2012)—a classification system for different categories of carbon dioxide emissions to create a standardized accounting system for GHG emissions. 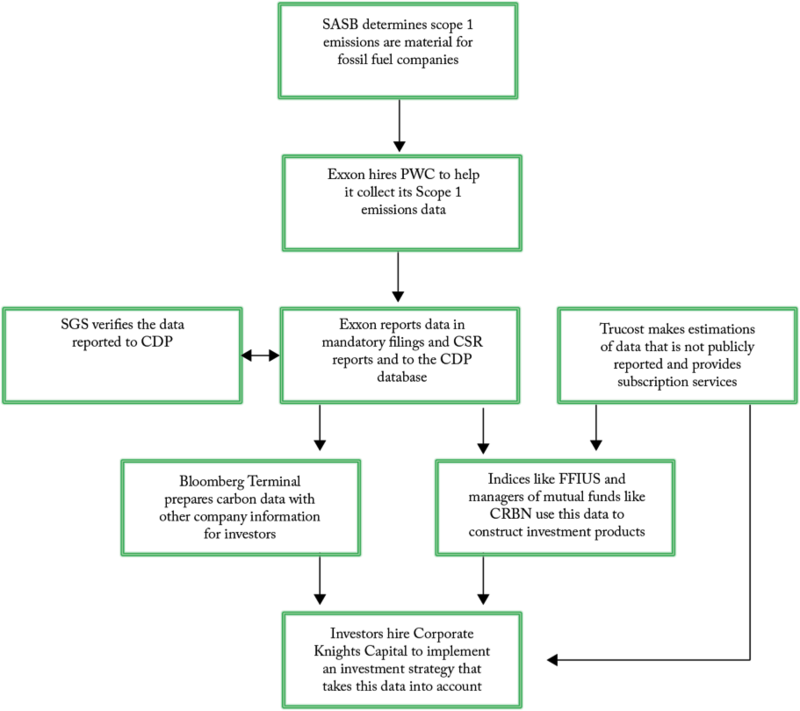 The Protocol created three “Scopes” of emissions accounting (Figure 2). These scopes make up the current standard framework for emissions accounting. Scope 1 Direct GHG emissions from operations owned or controlled by the organization. Scope 1 covers emissions directly generated by a company from the combustion of fossil fuels and the use of fluorocarbon gases. Scope 2 Indirect Energy GHG emissions resulting from the generation of purchased or acquired electricity, heating, cooling, and steam consumed within the organization. Scope 2 emissions account for the emissions from purchased electricity. Electricity emissions are generated when the supplying power plants burn fossil fuels, so the emissions are not directly generated on site. Scope 2 emissions for companies are also counted as Scope 1 emissions for utility companies. Scope 3 Other indirect GHG emissions (not included in scope 2) that occur outside the organization, including upstream and downstream from operations due to company’s control. Source: Greenhouse Gas Protocol, 2015. While some Scandinavian countries have since made carbon data reporting mandatory for certain industries, most countries have not. Typically, government-mandated reporting is limited to Scopes 1 and 2 only. An example from the transportation sector can help illustrate the difference between Scope 1 and Scope 2. An automobile company’s Scope 1 reporting would cover the emissions from fabricating parts, assembling cars and the painting and finishing of vehicles. Scope 2 reporting would cover the GHGs generated by the electricity and heat purchased from a utility company needed to power the assembly line. The emissions from a consumer driving the car would appear in consumer emissions, or in operational emissions of other companies using the automobiles (Scope 3). Scope 3 emissions data is necessary, however, to compare companies at differing levels of vertical integration (Figure 3). With only Scopes 1 and 2 data, a vertically integrated company may appear to have much higher emissions than a horizontal company, while actually being significantly less carbon intensive. An auto company, “Vertical Motors,” may efficiently source its own materials for building its car seats, while company “Horizonticar” purchases its car upholstery from a third party that has high emissions. Though “Vertical Motors” may be actively reducing its carbon footprint, a metric using only Scopes 1 and 2 means that “Horizonticar” has a lower total emissions footprint. Accounting for Scope 3 emissions of both companies, however, would highlight that fact that “Vertical Motors” has higher emission across the supply chain. Scope 3 emissions are important to track because these emissions typically represent a significant portion of the total emissions. Even if impossible to measure perfectly, it is important to consider the Scope 3 emissions of certain industries and sectors in particular. Within the energy industry, for example, Scope 3 emissions would include the burning of gas or oil and represent 90% of the total emissions for the sector. The relative importance of the different GHG emission scopes in each sector is based on their relative contributions to total emissions in the sector (Figure 4). Since Scope 3 takes up a substantial portion of total emissions, investor strategies that ignore Scope 3 fail to properly account for carbon risk. Source: “Discussion Paper: Reducing Emissions Across the Portfolio.” UN Principles for Responsible Investment (UN PRI). Accessed July 22, 2015. Reprinted with permission from South Pole Group. A metric of increasing relevance for investors, particularly investors in fossil fuel companies, is the carbon content of a company’s fossil fuel reserves. Some investor groups and nongovernmental organizations claim that companies with fossil fuel reserves are susceptible to devaluation from climate policy or alternative technologies because the valuation of these companies is heavily dependent on the ability to extract these reserves profitably. For instance, The Carbon Tracker Initiative estimates that approximately 50% of the valuation of a large oil company comes from the expected extraction of reserves at least 10 years into the future. Thus, if these reserves cannot be extracted profitably, they will be stranded and these companies could face significant devaluation (Campanale and Leggett 2011). This is referred to as the “stranded assets” argument. This reserves metric is applicable to the energy production industry and has limited use in other sectors of the economy. The Carbon Tracker Report listed the top 100 coal reserves-owning companies and top 100 oil & gas reserves-owning companies ranked them by the potential emissions embedded in their carbon reserves (measured in Gigatons of carbon dioxide). Emissions embedded in reserves can be measured in terms of CO2 even though the combustion of these reserves releases a variety of greenhouse gases because the global warming values of these gases can be accounted for in terms of CO2e (carbon dioxide equivalent, as discussed in Figure 1). Five types of organizations work to bring GHG data to investors. (1) Companies or data collectors collect the initial data. (2) Standard setting agencies guide the framework for data collection, which is then entered into (3) database organizations that house the data. 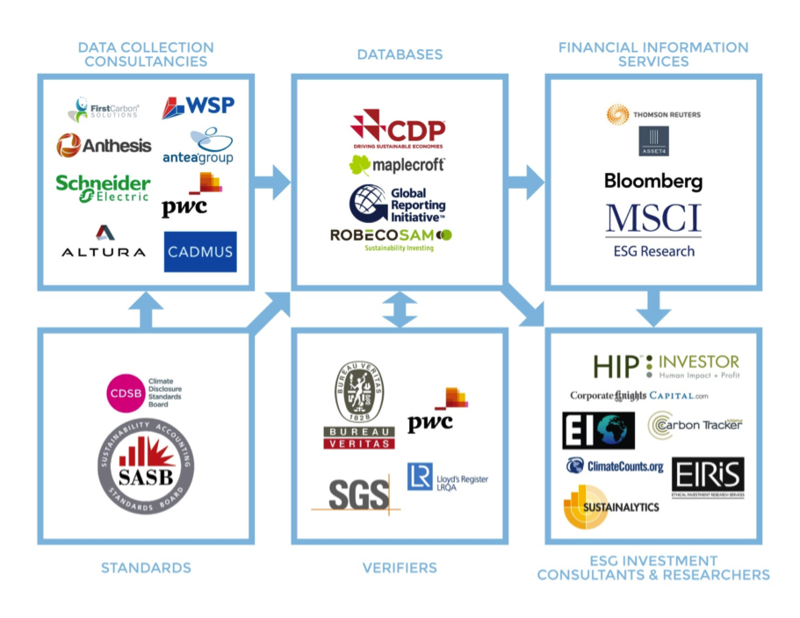 (4) Third-party verifiers and accountants often check the data before it is released to (5) financial information services firms, which present the information that is finally put into use by the ESG investment community, including investment firms, consultants, and research institutions (Figure 5). Governments can play a role in helping to define roles for the organizations responsible for stages 1 through 4 in the sequence outlined above. Regulated carbon markets around the world, including the EU Emissions Trading Scheme and the Regional Greenhouse Gas Initiative (RGGI) in the United States, collect Scope 1 emissions data on activities within the geographical boundaries of the market. The respective overseeing governments mandate the reporting of the emissions data according to its particular framework, collect the data, and employ third-party data verifiers to check the reported data. They also make this data publicly available. Given that these data sets are regulated by governments and verified by third parties, they are rigorous, and among the most robust, granular, and reliable data sets that exist. This data collection and verification can help establish a strong foundation to support mitigation policies. Today, over 40 countries already mandate emitters (at regional, national, and subnational levels) to provide GHG emissions-related data, although the focus of these reporting requirements varies widely by country (Singh and Bacher 2015). The limitation of these data sets, however, is that they only require the disclosure of Scope 1 data. As discussed previously (Figure 2), Scope 1 does not convey the full climate risks and opportunities relevant to a company. Companies may also disclose climate data voluntarily, due to investor pressure, because of existing or pending regulatory requirements, or to avoid litigation. On the regulatory side, the Securities and Exchange Commission (SEC), for example, ostensibly requires the reporting of material climate data (that is, emissions). Investors may also work in coalitions, such as through the Ceres Investor Network on Climate Risk (INCR), which represents US$13 trillion advocating for climate policies. INCR members consider the climate risk and opportunity of their own investments, advocate strong climate policy, and engage companies in their portfolios on climate disclosure and performance. The Climate Risk Disclosure Initiative was formed in 2005 by 14 leading investors and other organizations worldwide to improve corporate disclosure of the risks and opportunities posed by global climate change. Some companies also report greenhouse gas and carbon reserves data voluntarily for a variety of reasons, including company culture and public relations. As a result, in part, from investor pressure, Peabody Energy, a large private-sector coal company, recently reached a settlement with the New York State Attorney General to bolster its climate disclosure in order to avoid litigation (McDonnell, 2015). Most carbon data is incomplete because of the voluntary and unstandardized nature of the majority of disclosures, though there is still enough climate data to help guide investment decision-making from a broad perspective. For example, in 2014, the top 10% of companies responding to the CDP questionnaire received a disclosure score of 97% or above (Fox 2014). Additionally, there has been rapid improvement in the disclosure of data over the past few years. The 2014 CDP disclosure is a great improvement over the top 10% scoring 61% or above in 2008 (Fox 2014). Also, investors can join groups like the INCR to encourage companies to report more complete and thorough data. The movement to standardize data is being led by the Sustainable Accounting Standards Board (SASB) in the United States. This nonprofit organization convenes voluntary industry experts to develop a set of standard environmental, social, and governance metrics that are materially relevant to each industry. SASB is lobbying the SEC to make the reporting of these industry-specific metrics mandatory and consistent (Figure 6). The Sustainability Accounting Standards Board (SASB) was incorporated in 2011. Its mission is to establish industry based sustainability standards and to make disclosure of company information based on these standards publicly available. Industry working groups are in the process of completing standards for 80 industry groups within 10 sectors by 2016 guided by SASB’s classification system, the Sustainable Industry Classification System (SICS). These standards are designed for the disclosure of material (relevant to the prudent investor) sustainability information in mandatory SEC filings. The standards are also open to public comment as they are being developed through a transparent, multi-stakeholder process. SASB is funded by grants and donations mainly from philanthropies focusing on climate change and investing. SASB is also working in partnership with other climate data groups such as CDP and the Climate Disclosure Standards Board (CDSB). The UK-based CDP (originally the “Carbon Disclosure Project”) is both a data collector and a database: it solicits data from companies via questionnaires, and then scores companies on their performance and their transparency (Figure 7). CDP hosts a database of responses from 70% of Fortune 500 companies (Fox 2014). Unfortunately, this data is impacted by the voluntary nature of the requests: many companies answer only a subset of the questions asked. Another major growing area in carbon data is third-party verification, which relates to the issue of monitoring versus estimation. For example, PricewaterhouseCoopers is one of several used by companies that have verified the data submitted to the CDP database. Unfortunately, verifiers often evaluate unstandardized measurements, such as Scope 3 emissions, along the value chain. SASB is pioneering improved accounting standards to resolve this issue. The Carbon Disclosure Project was founded in 2000 in the United Kingdom, though the official name was later shortened to “CDP.” CDP is the largest source of voluntarily disclosed corporate climate data in the world. CDP produces a comprehensive questionnaire each year on company activities relating to the environment, and communicates with companies to encourage them to fill it out. CDP publishes the responses publicly on its website, indicating when the data is third-party verified, offering a subscription service for individuals or institutions who want to download large chunks of data at once. CDP is funded by a mix of subscription, philanthropic, government, and corporate sponsors. CDP collects data on a variety of climate risks and greenhouse gas emissions data reported by companies. From this data, CDP produces several quantitative disclosure and performance scores for companies based on the data they provide and how well they perform relative to industry peers. High marks are also given for qualitative categories, including whether a company has designed and implemented a sustainability plan. By the time disclosed carbon data reaches the screen of a financial terminal like Bloomberg, it has already passed through many phases. The data first had to be requested by a data collector, government, coalition of investors, or a database such as CDP. Then, the company has to collect the data to the best of its ability and submit that data to a database. Subsequently, a third party is often commissioned to verify that data. Finally, an entity like Bloomberg holds a license with that data provider to acquire the data. 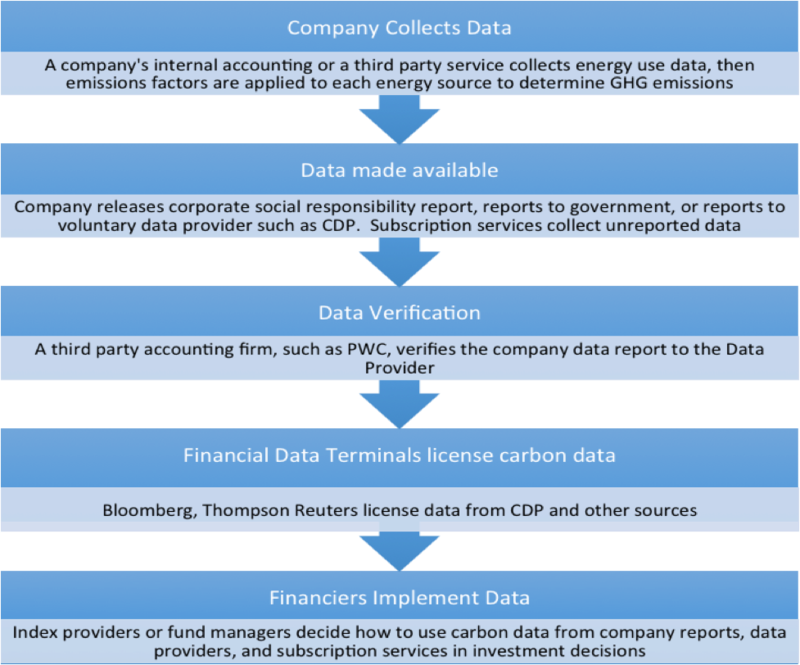 The process by which GHG emissions and reserve data flows from a company to an end-user is a fairly lengthy process. The overall process is outlined in Figure 8, and a specific example is given in Figure 9. As mentioned, GHG data is incomplete in a number of ways: not all data is reported; not all data is verified; data does not always allow for meaningful comparison between companies; and data is not always relevant to all companies. However, the data has improved and will likely continue to improve significantly over time. First, more companies are recognizing the importance of reporting climate data. For example, the number of companies voluntarily reporting to CDP has steadily increased from 253 companies in 2003 to 5003 companies in 2014, with the top 10% of company disclosure consistently rising between 2008 and 2014 (Fox 2014). Additionally, investors are demanding mandatory standardized reporting, led by groups like the SASB and the Climate Disclosure Standards Board. As groups like the Global Reporting Initiative continue to issue reporting guidance, companies will have an easier time reporting data at the same time as consultancy services are growing, given the increased demand for data. There is currently a consistent complaint among companies and investors regarding “data overload.” Without knowing what metrics are relevant to whom, climate data may be ignored by financial analysts. However, as standardization occurs it is likely a smaller set of data that is most material to investors will begin to emerge, and a virtuous cycle will begin: The financial community will find climate data more useful and invest in making it robust. With good data in hand, the next question becomes: What can investors do with it? When deciding how to compare companies, it is important to weigh the trade-off between materiality and comparability. While ranking all companies based on Scope 1 emissions allows comparison between companies across sectors, it is not always relevant to actual company climate performance and risk. For example, fossil fuel companies may have low Scope 1 emissions compared to revenues, but Scope 3 emissions can make up 90% of fossil fuel company emissions; therefore, analyzing Scope 1 emissions does not capture the climate-risk profile of most companies. SASB focuses on the materiality approach and recommends particular sustainability metrics for specific industries. Other data platforms and ranking systems, like the CDP Leadership Index, emphasize comparability: They compare all companies based on steps they are taking to mitigate and adapt to climate change (this data is outside the scope of this report). The choice between comparability and materiality will be determined by the various screening and reinvestment approaches that the majority of investors are taking. Next, the emissions data should be normalized to consider emissions intensities of companies as opposed to absolute emissions, which strongly correlates to company size. GHG emissions can also be compared against revenues, unit sales, or some other aspect of corporate financial indicators. Investors can use this normalized measure to evaluate the regulatory risk a carbon price will have to a given company or industry. The following section (beginning with Figure 10) explores the pros and cons of the various comparison metrics. These comparison factors include those found in the Bloomberg terminal. GHG Emissions/ Sales (Operating Revenue or EBITDA) Allows for companies across industries, with products of varying price, to be compared. Within an industry, revenue/EBITDA is not as useful as per-unit product because revenue and EBITDA vary based on factors such as regional inflation. Furthermore, there are other income contributors to a company’s revenue that are not indicators of the company’s core business, such as income from investments. GHG Emissions/ Unit Product Within industries of comparable products, emissions/unit product is better for comparing carbon intensity of products than emissions/sales. This metric removes regional cost-of-living price distortions and other global market differences from the analysis of the comparative climate risk to firms. Per-product comparisons can also determine commitment to low-carbon businesses because changes in emissions intensity of products must mean that products or the processes to create the products are less emissions intensive. A per-unit product metric is difficult to use when comparing products of different value and lifetime. An airplane manufacturer cannot be usefully compared to an appliance manufacturer on a unit-product basis because, based on size of the product, the airplane manufacturer will always have more emissions per-unit product. Additionally, it is difficult to measure per-unit product for service industries, such as the financial sector. GHG Emissions/ Assets This approach makes the most sense when examining the embedded emissions of assets compared to total assets. For example, this approach allows investors to examine the degree of stranded asset risk (technology and regulatory risk) from held fossil fuel reserves. This approach depends heavily on the company business model; Uber will have high emissions/assets because it does not own automobiles, while a taxi company will have low emissions/assets, despite similar levels of automobile emissions rates. This flaw disappears when using the revenue or product/service ratios. GHG Emissions/Number of Employees Emissions/employees should approximately capture the carbon footprint of varying levels of labor. This measure is often useful for companies in the service industry that do not sell products. If two hypothetical firms create the same product with the same total emissions, emissions/employee would make the labor-intensive firm seem deceptively less polluting. Additional difficulties abound in categorizing companies that rely on independent contractors or distance themselves from their supply chain. Revenues from Green Products & Services/ Total Revenues This approach provides an indicator of how committed a company is to being a part of the green economy. For example, a fossil fuel company may earn greater sales from ventures outside of its fossil fuel portfolio, lowering emissions/sales, even if its fossil fuel product portfolio remains static. This metric avoids this issue. Clean energy exchange-traded funds often use this metric to decide whether a company belongs in the fund. This approach does not reflect climate leadership in operations. For example, Google installing solar power for servers would show up in an emissions metric, but in this measurement, it is not a product or service being offered in the market, nor is it a revenue source. These measures are useful in examining the event of a price on GHG emissions. In this case, the best performing companies, all else being equal, should be those with the lowest emissions per-unit sales. For example, while a carbon price would increase costs for plastic companies, plastic companies with the most efficient fuel and waste processes would gain a comparative advantage within their industries. A number of investment strategies that investors use for climate investing can be grouped into six specific approaches (Figure 11). Each strategy focuses around a particular type of data; the growth of emissions-based investment strategies will depend in large part on the growth of supporting data. Any of the strategies employed should also be consistently monitored to incorporate changes in sector or company progress toward reducing emissions, or the increasing exposure to low-carbon technologies, depending on the approach employed. Industry-Inclusion and Industry-Exclusion Approaches. These approaches entail including or excluding companies based on their industry classification. Renewable-energy inclusion strategies will focus on the “green economy,” while fossil fuel industry-exclusion approaches will exclude oil-, gas-, and coal-related companies such as the extraction, production, exploration, and refining companies. Screens that are more exclusive may include fossil fuel service and equipment, and marketing companies. Screens that are even more detailed may exclude heavy fossil fuel users, such as utility and trucking industries. To construct industry inclusion and exclusion funds and indexes, a classification system must be employed. Three major classifications are used in climate investing products (Figure 12). GICS The Global Industry Classification Standard, used by MSCI and S&P, classifies companies by their market orientation. ICB The Industry Classification Benchmark, used by Dow Jones and FTSE, classifies companies by the nature of their business. SICS The Sustainable Industry Classification System, recently developed by SASB, classifies companies by resource intensity and sustainability innovation potential. Industry exclusion is a process that allows investors to avoid participating in an industry that they think in some way conflicts with their values, such as by contributing to climate change, environmental damage, or the displacement of vulnerable populations, and so on. Investors may also want to remove specific risks (such as companies with the highest fossil fuel reserves) from their portfolio. The industry-exclusion approach also provides a fairly straightforward means for negatively “screening out” companies based on already available classification systems. At the broadest level, the logic behind industry exclusions from a risk perspective is that certain sectors are tied to fossil fuels, regardless of their performance relative to their industry, and that they will likely be affected by increased climate regulation and alternative-energy technology development. Thus, it makes sense to identify and remove all or some of them from certain portfolios, depending on how much an investor wants to reduce exposure. On the other hand, the industry-exclusion approach may miss companies that will be heavily affected by climate change if their main lines of business are not considered fossil-fuel-related (classification systems only assign one classification to each company, so a general mining company that also produces a lot of coal may be missed by the industry-exclusion approach). Most industry-exclusion approaches, for example, do not exclude all companies on the Carbon Underground 200,TM a list of the 200 companies with the largest coal and oil reserves. The industry-exclusion approach can also reduce industry diversification within a portfolio, which may be unacceptable to some investors. Investors who have a moral imperative to avoid all companies tied to the fossil fuel industry might choose the industry-exclusion approach. The “Green-Economy Industry-Inclusion” approach selects companies whose primary business is related to promoting the green economy, the largest subsection of which is clean renewable energy. Many companies primarily focused on the green economy may still produce and generate revenue from fossil-based products or hold fossil fuel reserves (often utility companies fit this description), many green economy funds may still hold companies involved in the fossil economy and companies that hold fossil fuel reserves. This approach reduces exposure to climate risk and provides exposure to climate opportunity. Investments in the green economy can also have impact on climate mitigation, especially if the funds invested are additive within an illiquid market such as private equities. Investors who want to promote the transition to a green economy and want to take part in the upside of this transition might choose the industry-inclusion green-economy approach. Reserves-Based Approach. This approach typically uses a fund or index to exclude companies based on emissions embedded in reserves or embedded emissions relative to company size. The reserves-based approach responds to the threat that existing fossil fuel reserves will not be sold due to climate regulations. As investors evaluate this downside probability, the market may re-price fossil fuel companies well before restrictive legislation is enacted—as soon as there is an expectation that the reserves will be stranded. Since oil and gas reserves vary in quality, and refining produces a variety of oil and gas products with varying emission factors, a general carbon-intensity coefficient is used by data providers to calculate forecasted reserves-based emission. Relative rankings and screens for companies based on company-owned carbon reserves offer investors another climate factor; a reserves-based approach can also be used to examine fossil-fuel-reserves value as a percentage of net asset value. This information can often be found on company filings, but subscription sources, like Fossil Free Indexes, actively track reserves data. For an example of a reserve-based approach: a portfolio could be constructed using the Carbon Underground 200TM list to exclude the top 100 coal-reserves-owning companies and top 100 oil- and gas-reserves-owning companies according to emissions embedded in fossil fuel reserves. This particular approach covers approximately 97%–98% of listed company reserves ownership and is the strategy most fossil-fuel-divested individuals and institutions have used to divest (Fossil Free Indexes 2015). Investors looking to minimize climate risk and investors who have a mandate to avoid fossil-fuel-reserve-holding companies might choose the reserves-based approach. Carbon-Intensity Approach. This approach has a number of variations aimed at reducing fossil fuel exposure without excluding entire industries. For instance, carbon indexes constructed to mimic traditional market-cap-weighted indexes will construct portfolios from a previous time period’s carbon emissions and seek a lower carbon intensity per dollar (perhaps while maintaining covariance against an index such as the S&P 500). This ensures that investors can adopt climate-investment strategies while tracking an investment-policy-mandated traditional market-cap-weighted index. A “best-in-class” approach would include companies leading their industries in mitigating carbon risk, while a “worst-in-class” approach would exclude companies significantly below their industry average. Even without excluding companies, this investment strategy reduces risk exposure to climate policy by underweighting emissions-intensive companies. Carbon-intensity approaches can employ Scopes 1, 2, and 3 emissions data, though it is important to keep in mind which scopes are relevant to each industry group. Given that Scope 1 and 2 emissions-calculation methodologies are common to all companies and have clear methodologies, most carbon-intensity approaches utilize these scopes. Investors who want to minimize climate risk, yet do not have a moral mandate to entirely avoid investments in those companies contributing the most to climate change, might choose the carbon-intensity strategy. Environmental, Social, Governance (ESG) Integration. Integration of ESG metrics in investments has grown from nearly $6 trillion in 2012 to $12.9 trillion in 2014 (Global Sustainable Investment Alliance 2014). Commitments to the UN Principles for Responsible Investing have also grown significantly since UN PRI’s inception in 2006. In April 2006, less than $10 trillion in global assets under management were represented, whereas in April 2015 the number had grown to approximately $60 trillion (Figure 13). Climate factors are one of many ESG strategies—any of the above strategies may be used synergistically with other ESG strategies to identify companies to perform both inclusions and exclusions. Investors who employ general socially responsible investment practices and investors who want to avoid risk and maximize opportunity associated with social, governance, or environmental issues might choose the ESG-integration approach. Source: UN PRI. “PRI Fact Sheet.” 2015. http://www.unpri.org/news/pri-fact-sheet/. Accessed November 6, 2015. Actively Managed Climate Investment Strategies. If investors are interested in taking an active approach to investing using climate change as a frame, they could theoretically construct portfolios based on macroeconomic factors, such as regulations; traditional factor-based investing (for example: momentum, growth, or value); and, fundamental company analysis while also integrating climate factors into their security selection process. These investors could aim to apply first, second, and third order climate effects and apply additional data sets relating to climate change to the valuation process for security selection. Accordingly, investors pursuing actively managed climate-investment strategies may be able to better identify risks and opportunities from climate change, although there is no guarantee of outperformance. As the response to global climate change grows, so do the potential risks to investors. Asset owners and advisors are increasingly examining their underlying assets to determine risk and opportunity when it comes to mitigating and adapting to climate change. Many of these decisions must be made based on quantitative data. Therefore, to be able to make sound investment decisions, astute investors must keep abreast of the evolving landscape of climate data. Over the next several years, the biggest potential impact on investors related to climate change could come from government regulation, which could set a standard price on carbon. Furthermore, if regulators were to emphasize accurate disclosure of particular metrics, investment strategies would likely adapt to incorporate those standard metrics. In the absence of uniform disclosure, strategies based on emissions data are lacking crucial information. In this current data regime, many investors are choosing an industry inclusion-/exclusion- or a reserves-based approach to minimize carbon-risk exposure. Coordinated investor requests for voluntary company climate-data disclosure, such as those coordinated by the UN PRI, continue to have a large effect at securing data and building understanding of the data issues among investors and regulators. Ultimately, the more certain investors can be of the climate risks of their investments, the more informed they can be when deciding how to evaluate the risk and return profiles of their investment portfolios. The authors would like to thank the many people who contributed time and effort to this report. It is the product of countless interviews, revisions, discussions, and ideas. The following experts provided guidance on the report as a whole: Todd Cort, PhD, Faculty Co-Director at the Yale Center for Business and the Environment and Yale Lecturer in Sustainability; Jacob Galardi, Senior Associate, Climate and Green Bond Research, Infracredit; Anadi Jauhari, CAIA, Senior Managing Director of the Emerging Energy and Environment Investment Group; Cary Krosinsky, Responsible Investing Consultant, Lecturer, and Advisor; Jason McCoy, MA; Consultant with Phoenix Global Impact; Jenna Nicholas, CEO & Founder of Phoenix Global Impact. “Mandatory GHG Reporting—Reported Emissions.” 2015. California Environmental Protection Agency, Air Resources Board. Accessed January 23, 2016 from http://www.arb.ca.gov/cc/reporting/ghg-rep/reported-data/ghg-reports.htm. Campanale, Mark, and Jeremy Leggett. “Unburnable Carbon: Are the World’s Financial Markets Carrying a Carbon Bubble?” London: Carbon Tracker Initiative. Accessed July 19, 2015 from http://www.carbontracker.org/wp-content/uploads/2014/09/Unburnable-Carbon-Full-rev2-1.pdf. Campanale, Mark, and Jeremy Leggett. 2014. “Unburnable Carbon 2013: Wasted Capital and Stranded Assets.” London: Carbon Tracker Initiative. Accessed January 20, 2016 from http://www.carbontracker.org/wp-content/uploads/2014/09/Unburnable-Carbon-2-Web-Version.pdf. DiNapoli, Thomas P. 2015. “State Comptroller DiNapoli Positions New York Pension Fund For Low-Carbon Future: Launches Expandable $2 Billion Low Emissions Index.” Office of the New York State Comptroller. Accessed January 20, 2016 from http://www.osc.state.ny.us/press/releases/dec15/120415.htm. “Discussion Paper: Reducing Emissions Across the Portfolio.” UN Principles for Responsible Investment. Accessed July 22, 2015 from http://2xjmlj8428u1a2k5o34l1m71.wpengine.netdna-cdn.com/wp-content/uploads/PRI_Discussion-Paper-on-Reducing-Emissions.pdf. “Divestment Commitments.” Fossil Free. Accessed July 17, 2015 from http://gofossilfree.org/commitments/. “Measuring the Growth of the Global Fossil Fuel Divestment and Clean Energy Investment Movement.” 2015. Arabella Advisors. Accessed January 20, 2016 from http://www.arabellaadvisors.com/wp-content/uploads/2015/09/Measuring-the-Growth-of-the-Divestment-Movement.pdf. “Fossil Free Indexes.” Accessed November 6, 2015 from http://fossilfreeindexes.com/research/. Fox, Marc. 2014. “Climate Action and Profitability.” CDP S&P 500 Climate Change Report 2014. Accessed November 4, 2015 from https://www.cdp.net/CDPResults/CDP-SP500-leaders-report-2014.pdf. “Global Sustainable Investment Review.” Global Sustainable Investment Alliance, 2014. Accessed November 6, 2015 from http://www.gsi-alliance.org/wp-content/uploads/2015/02/GSIA_Review_download.pdf. “Greenhouse Gas Protocol.” Accessed July 19, 2015 from http://www.ghgprotocol.org/. Kershaw, Jessica. 2016. “Secretary Jewell Launches Comprehensive Review of Federal Coal Program.” U.S. Department of the Interior. Accessed January 23, 2016 from https://www.doi.gov/pressreleases/secretary-jewell-launches-comprehensive-review-federal-coal-program. McDonnell, Tim. 2015. “One of the World’s Largest Coal Companies Misled Investors About Climate Change Risk, Investigation Finds.” Mother Jones. Accessed January 18, 2016 from www.motherjones.com/environment/2015/11/peabody-coal-climate-investors-attorney-general. “News | Unity College | America’s Environmental College.” Accessed July 19, 2015 from http://www.unity.edu/news/unity-college-reports-no-loss-fossil-fuel-divestment. Raval, Anjli. “IEA Warns Oil Market Could ‘Drown in Oversupply.’ Financial Times. Accessed on January 23, 2016 from http://www.ft.com/intl/cms/s/0/ae9aa766-be94-11e5-846f-79b0e3d20eaf.html#axzz3xvuBTEBy. Sims, R. E. H., R. N. Schock, A. Adegbululgbe, J. Fenhann, I. Konstantinaviciute, W. Moomaw, H. B. Nimir, B. Schlamadinger, J. Torres-Martínez, C. Turner, Y. Uchiyama, S. J. V. Vuori, N. Wamukonya, and X. Zhang, 2007: “Energy Supply.” In Climate Change 2007: Mitigation. Contribution of Working Group III to the Fourth Assessment Report of the Intergovernmental Panel on Climate Change, edited by B. Metz, O.R. Davidson, P.R. Bosch, R. Dave, L.A. Meyer. Cambridge, UK and New York, NY, USA: Cambridge University Press. UN PRI. “PRI Fact Sheet.” Accessed November 6, 2015 from http://www.unpri.org/news/pri-fact-sheet/. PRI and Global Compact LEAD. 2013. 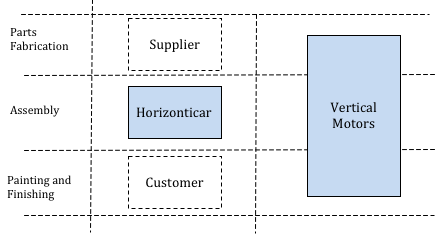 The Value Driver Model: A Tool for Communicating the Business Value of Sustainability. A PRI-UN Global Compact LEAD collaboration on creating long-term value. VDM_Report.pdf. Accessed July 19, 2015 from http://2xjmlj8428u1a2k5o34l1m71.wpengine.netdna-cdn.com/wp-content/uploads/VDM_Report.pdf. World Health Organization. 2015. “WHO. Climate Change and Health.” WHO. Accessed July 17, 2015 from http://www.who.int/mediacentre/factsheets/fs266/en/. 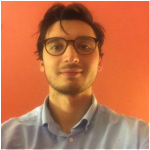 Patrick Reed is a senior at Yale University studying economics and environmental studies. He has been a fellow at Mosaic, a Udall scholar, and President of the Yale Student Environmental Coalition. David Gabe Rissman is a physics major at Yale University. 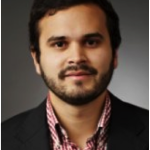 He studies climate finance, climate data, climate policy, and renewable energy technology. Logan Yonavjak has a background in ESG investment product development, social and environmental impact metric development and implementation, and project finance experience with a wide range of nonprofits, private equity firms, and institutional investors. 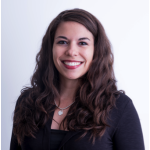 She previously worked as an Analyst at the World Resources Institute and is currently pursuing a master’s of forestry and an MBA from Yale University, and holds a BA from The University of North Carolina at Chapel Hill. Evan Dryland, CFA, has worked on a wide range of mergers and acquisitions, private placements, and financing transactions representing over $100 billion in value. He has spent almost a decade working with a variety of renewable and carbon-based energy companies. 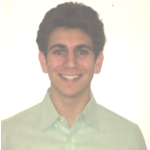 Evan is currently employed by J.P. Morgan’s Investment Banking division within their mergers & acquisitions group. He holds both master’s and bachelor’s degrees in business administration from the NYU Stern School of Business and Emory University Goizueta Business School, respectively. 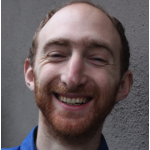 Yonatan Landau is a Bay Area-based consultant and co-founder of the Yale Responsible Investing Group. He has worked at DBL Investors and the White House Office of Management and Budget, launched numerous nonprofit initiatives, and received an MBA from the Yale School of Management. Dillon Lanius has worked across five continents in least-developed, emerging, and post-modern economies to create market solutions for climate, conservation, and human development problems. He serves as an advocate, consultant, operator, philanthropist, and investor in businesses, nonprofits, and ideas that are transforming the world. Dillon is currently the managing member of Northern Shrike, LLC, an investment company, co-chair of the Nexus Climate Lab, board member of the Livingston Ripley Waterfowl Conservancy, commissioner for the International Union for the Conservation of Nature (IUCN), committee member for a Carbon Disclosure Project Technical Working Group, board member of the Manhattan Institute’s Adam Smith Society and president of the Michael Price Investment Fund at NYU Stern. 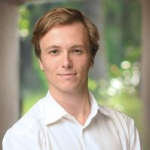 Sebastian Vanderzeil has worked in government, at fortune 500 companies, and in economic consulting on climate change, energy, and utilities. He was a dean’s scholar at New York University’s Stern School of Business, graduating with an MBA. 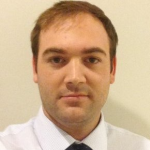 He is currently an analyst with a sustainability investment group in New York. This figure refers to global average temperature and is relative to the pre-industrial level. Assets Under Management for this figure represents the total Assets Under Management represented by the firms who have pledged to divest from fossil fuels. Greenhouse Gas Emissions are sometimes reported as Carbon Dioxide Equivalents, CO2e, or in terms of the Global Warming Potential, GWP. The terms are not interchangeable, but GWP can easily be converted into CO2e. The conversion from gases to CO2e or GWP is purely scientific, with standards set by UNEP and IPCC. Please note that this list of examples is not comprehensive. For instance, under California’s Regulation for the Mandatory Reporting of Greenhouse Gas Emissions (MRR), industrial sources, fuel suppliers, and electricity importers must report their annual GHG emissions to the California Air Resources Board (ARB). For reporters subject to the California Cap-and-Trade Program, submitted data are verified by an ARB-accredited independent third-party verifier (California Environmental Protection Agency, Air Resources Board, 2015). Disclosure: one of this report’s authors has been involved in several of SASB’s sector working groups. Changes in government regulations because of climate change risks will affect global trade, economies, and financial valuations beyond the fossil fuel sector. Industries and sectors as diverse as agriculture, construction, energy, information technology, infrastructure, insurance, mining, timber, transportation, waste, and water will be affected by climate change. Thus, actively managed climate-investment strategies may be better able to realize better performance from a traditional market-cap-weighted benchmark that is not aware of or able to navigate climate risks and opportunities.